According to a police report, the parents of the infant heard her crying. When they came into the bedroom, they discovered the dog standing over the bassinet. “The, of course the child, according to the statements was in a bassinet, there was blood in the bassinet where the dog had attacked the child. …It was very serious injuries to the upper body and the head; the child had been seriously mauled by the animal,” Parsons said. According to Sheriff Parsons, the initial call came in around 11:40 a.m. Wednesday that a family pet had attacked a baby. The baby was first taken by family members to Lonesome Pine Hospital. From there the 8-day-old infant was transported to Holston Valley Medical Center, and then to UT Medical Center in Knoxville. Parsons said the baby girl passed away at UT Medical Center around 4 p.m.
Sheriff Parsons said this is an ongoing investigation with the Lee County Department of Social Services. "I'm concerned about whether the child was protected...so the tough part for me is who is in the right and who is in the wrong, and you hate to charge parents that are grieving over a child, but at the same time you have to consider the rights of the child. We are investigating in coordination with the Lee County Department of Social Services and animal control. We will get all of our information together and present it to the commonwealth’s attorney to see if there are any charges of endangerment or neglect to the child,” Parsons said. The family has two other older children and two other dogs. JONESVILLE — An 8-day-old girl succumbed to injuries inflicted by the family dog on Wednesday, Lee County Sheriff Gary Parsons confirmed. Parsons said his office received a call for assistance at 11:46 a.m. Wednesday from a residence in the Seminary community, an area located not far from Big Stone Gap. By the time deputies arrived, the child’s father had already left with the infant for Lonesome Pine Hospital in Big Stone Gap. Parsons said deputies were told that the dog, "A LARGE SHEPHERD TYPE," " attacked and mauled the infant as she was in a bassinet. Parsons said the baby suffered injuries primarily to the upper body and head. He said she was transferred to Holston Valley Medical Center in Kingsport and then to the University of Tennessee Medical Center, where she died just after 4 p.m.
LEE COUNTY, VA - (WJHL) - According to Sheriff Gary Parsons of the Lee County Sheriff's Office, A FAMILY DOG mauled an 8-day-old baby at their home Wednesday. He told News Channel 11 the baby girl passed away at UT Medical Center. Sheriff Parsons said the call came in around 11:40 a.m. that a family pet had attacked a child. Within a matter of hours, the child was initially taken to Lonesome Pine Hospital, then Holston Valley Medical Center and then to UT Medical Center in Knoxville. Parson said the baby girl had extensive injuries to the upper part of her body. The family's dog is with the Lee County Animal Control. The family, we're told has two other older children. We will continue to bring you more information as it becomes available. I personally don't believe that dogs recognize infants as little people. Infants look and act more like squeaky toys than people. Because of this, I really don't believe that any dogs are responsible for this type of killing. I think the parents/caregivers are more responsible than the dog for this killing. The rule that no dog should ever be left unattended with an infant was ignored; and, as a result, an infant is dead and a dog acting on instinct will be destroyed. Dogsbite.org is reporting that the "dog" is a Wolf Hybrid. WHO WOULD LET THAT NEAR THEIR BABY?!!!! I'm not sure now about that picture of the pit looking mixed breed dog. It did not state that that picture was a file photo. Regardless, why would anyone let any large dog near a newborn? I obviously don't know if the killer was really a wolf dog. There is a lot of misinformation with people saying dogs are wolf hybrids when they really aren't. Some idiots think the introduction of wolf genes in dogs is a fantastic idea. At any rate, wolves have extremely high prey drive, as they have to hunt to survive in the wild. Only an insane idiot would leave an infant unattended with a wolfdog. Maybe the family didn't want the baby. Better check to see if there was life insurance on the baby. 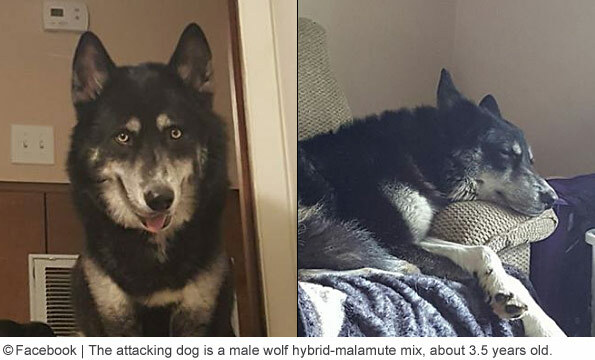 Dogsbite.org has a photo of the wolf hybrid in question. I still cannot comprehend why anyone would have a wolf around their baby? Are people that stupid that they do not understand that wolves are wild predators? I do not accept that a half-dog, half-wolf could be a safe pet. I want a cobra hybrid! It's a cobra mated with a garter snake. It's perfectly safe to have around infants and small children. These parents are idiots, and it's too bad that the infant had to lose his or her life, instead of mom and dad. Anon 11:58, I always wonder the same thing, did the parents even want the kid? How else do we explain such reckless behavior? My son and I were at our vets before our basset hounds died, maybe 2015-16, and he asked the vet about keeping wolves. She said it is restricted in Alabama and she also mentioned that rabies vaccinations have never been tested on wolves/ wolf hybrids and there were questions as to the effectiveness of the vaccine on these animals. I have never heard that mentioned before. 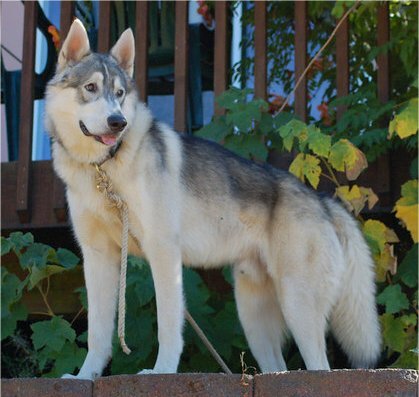 DogsBite.org has a picture from a facebook page of the kennel that sold the family the wolamute and that was one BEAUTIFUL ANIMAL!!! I remember finding a story of an infant death here in Alabama on Google Archives that happened I believe in the 1980's, I'll have to look it up, anyway the baby was placed on a bed in a bedroom with a window in it in grandparents home. The young mother left room....a German Shepherd type dog that was chained up on a runner outside was able to jump through the window and killed the infant without any noise. No one knew until they came back to check on the baby later that the dog had killed the baby! We don't know yet what really happened here but I find myself asking, "Surely they didn't have this animal in the house, in the same room with this newborn baby?" June 12, 1982 - Warrior Al - A guard dog owned by the great-grandparents of a 7-week-old baby jumped through a screened bedroom window and attacked the sleeping infant killing him, police said. "Roy Emmanuel Hamilton Jr. was lying in a back bedroom of his great-grandparent's home on Friday afternoon when the 4-year-old dog, still leashed to a cable with a 20-foot chain, tore a hole through a window screen and jumped through," said officer Myron Massey. The dog--a mixed breed --but mostly German Shepherd --was taken to an animal shelter and destroyed. "I don't know what made him do that," said the infant's father, Roy Hamilton. Rosa Davis, the child's great-grandmother, said she was in the front of the house when she heard the baby's cries. The baby's mother, Elaine Hamilton, had gone to her own residence next door. Mrs. Davis told Police the child was bitten several times on the head and shoulders. The dog, Joe, was standing beside the bed. "The animals 20-foot chain was attached to a 100-foot cable just behind both houses, allowing it to run back and forth," said Jimmy Davis, the infant's great-grandfather. "He was pretty mean. He didn't allow nobody around the back yard." The baby was pronounced dead at Carraway Medical Center in nearby Birmingham, hospital officials said. Veterinarians normally vaccinate wolf hybrids for rabies, as vaccine is used to protect people from rabies exposure. There is absolutely no reason not to vaccinate them. However, since rabies vaccine has not been proven to produce immunity to rabies in hybrids, in my state, wolf hybrids that bite are to be euthanized immediately and tested for rabies. Even if the bite is a minor one, this is true. Wolf hybrids are NOT quarantined for ten days. They are destroyed. Rabies or not, wolf hybrids are a BAD IDEA! I would think rabies would be the least of any concern. Wolves have bone crushing bites, are known killers, and are not domesticated. If anyone gets past those reasons not to get a wolf they deserve to get rabies! I've had a change in opinion about people who allow dangerous dogs around their children. I assumed that most of them just listened to the myths perpetrated about the breed in question and didn't know any better. The wolf hybrid has been greatly romanticized historically, and, like the pit bull, is often said to be a great and loyal pet. I thought that most of them just didn't know any better. But then I got to thinking about my own search for a good dog for my children. They were 2 and 4 at the time. This was back in 2000, before I was aware of the deaths and maulings that go hand in hand with pit bulls and their ilk. I didn't know what kind of dog I wanted, but I had a list in my head of dogs that I felt were unsuitable to have around children of that age: Small dogs, chows, GSD's, pit bulls, rottweilers, dobermans, and huskies were the main dogs on this list (wolves weren't on the list because they weren't even a consideration). I don't know where I picked up this knowledge, but I knew they were dogs that were not suitable for children. I knew. No one could have changed my opinion and convinced me to adopt or buy any of those breeds to keep around my children. I'm not a brilliant person. I am not an expert on dog behavior. But I knew. These parents should have known. They should have known. It's not rocket science. It's common sense and protecting your children. I'm uncomfortable putting blame on parents. As a parent you do everything you can to keep your kids safe. We put our kids in car seats and childproof our homes. We put fences around our swimming pools and put trigger locks on our guns. My brother-in-law got rid of his much-loved 12 foot Python when his daughter was born. I'm really conflicted by this. The parents have suffered an unimaginable loss, and who am I to point a finger and say, "You should have known"? But, damn, how could they not? "I'm not a brilliant person. I am not an expert on dog behavior. But I knew. These parents should have known. They should have known. It's not rocket science. It's common sense and protecting your children." I beg to differ Farmer Jane, you are brilliant in my book! The parents did know. Wolves are not sold in pet stores, and you have to go out of your way to get one. Most normal parents get normal dogs and treat them as if they are "wolves" when there are children involved. Yes, the breed matters and should not be taken lightly. Only insane parents bring home half wolves, and allow the wolf access to their precious babies that wolves see as prey. I mean, seriously, you'd have to be a complete zombie idiot that knows nothing of predator behavior to be oblivious that the carnivore you've brought into your home would want to eat your baby.